During the year 1812, French men's clothing was nowhere near as important as most men's and women's concerns over the war in Russia. Dress was, however, changing rapidly in this time period, partly as an ongoing response to the ideals of the revolution, and partly as a reflection of France's shift in European hegemony. The period 1800 to 1815 marked the First French Empire and clothing was distinguished by a neo-classical look. Starting in the 1790s, men's dress became simpler, as well as darker and duller. The idea was that decoration, elaborate trim and color were "irrational" and thus "feminine" - not something fit for a proud Frenchman. With this attitude came the phasing out of fashion of wigs and hair powder, and the shift from breeches to long trousers, like those worn by sailors and other laborers. The fashion statements were intended to demonstrate that even the wealthy and important men were no better than those socially beneath them, but they unwittingly paved the path towards modernity. By 1812, French men's clothing was more dull than it had been in centuries. The fashion magazines encouraged foppishness, even extremity, but the men who were at the center of the fashionable world were displaying more simple styles. Trousers were now being worn as part of standard dress, rather than as a radical fashion statement showing oneself aligned to the common man. Those who had participated in a radical revolution were increasingly unadventurous in their dress. One aspect of 1812 French men's clothing wherein a man could express his bolder fashion sense was in his accessories. Every important man still wore boots, hats, collars and neckties as part of his daily dress and it was with these - especially the ties - where a man might go to extremes. The tie, then called a cravat, the name by which it is still referred to in France, could be a range of colors and patterns and trimmed with lace. There were various ways of tying them and this, as well as the color and pattern, could say something about a man and his style. As clothing continued to trend towards the conservative for men, a tie remained one of the few outlets he had to show some flair. While the War of 1812, fought between the British and Americans, had some impact on France, it was the war with Russia that fomented radical change throughout the European Continent. 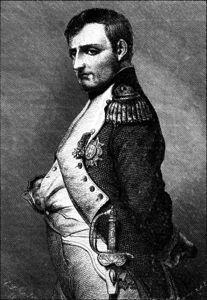 The year 1812 was ominous for Napoleon's empire, marking the beginning of his swift decline. He had overreached in Russia and the losses to the French army were devastating. France's hegemony in Europe was over. Napoleon insisted that men at court dress in a style that recalled the soldiers in the field, only much more expensive, of course. He wanted to promote French fashion and encourage more money spent on clothes, so he insisted on more and better fabric being used for items. Women had a harder time with this, as their dresses became more elaborate and they were not allowed to wear the same dress at court twice. Men were expected to wear satin trousers and coats styled like that of the officers. The militaristic style of dressing continued even as France's military fortunes declined. Napoleon understood that to be a world power required influence in many spheres, of which fashion was one of the more important. While his attempts to bolster the French fashion industry during the period of the first empire were not greatly successful, they set the stage for the upcoming Belle Epoque in 1860, when couture was born. French fashion would then always be influential in the dress of both women and men.